This handsome boy arrived in November 2017 from the Hooved Animal Sanctuary in Vermont. For a draft, Adam is a bit on the smaller side at 16 hh, and he immediately won us all over with his sweet but sensitive demeanor. This boy had spent most of his life tied in a straight stall before landing with the HAS, and at the time of his rescue he was in poor condition and suffered from severe ulcers. Under the love and care of the HAS crew, Adam made a big physical turnaround and had basic training during the summer of 2017. Adam still has anxiety due to his past experiences, and we will be continuing the slow and steady work begun in Vermont. He has nice ground manners, roundpens and lunges well. He has been seen by the farrier several times but still needs practice in holding up his feet while being trimmed. Adam has begun work under saddle and can walk/trot in the arena, but he particularly loves his rides out on the trails. At this point we use a friend for a lead while we're working on steering, but Adam is gaining in confidence and we have high hopes that he will make someone a steady trail partner. 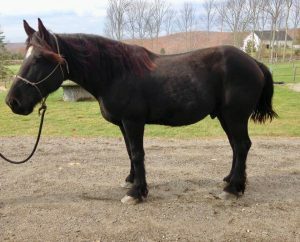 He can still become fearful of certain things around the barn, and will do best with a patient and confident handler. 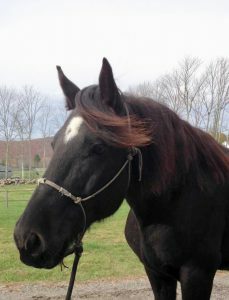 Adam is available for adoption through the Hooved Animal Sanctuary. Update: In June 2018 Adam was adopted into a wonderful family. Two years ago when he first arrived at the Hooved Animal Sanctuary, Adam was in poor health and suffering from severe ulcers and anxiety. Today he returned to Vermont, happy and healthy, to begin his new life as a pleasure riding partner. We are thrilled for Adam and his good fortune, and wish he and his new family many wonderful years together.